Farmers could face up to a 25pc drop in milk yield as the risk of lungworm in cows increases due to the extreme weather conditions this year. Glanbia vet Shane McElroy told farmers at the co-op’s fodder planning meeting in Navan that dairy herds are at risk of developing lungworm which can cause a significant reduction in milk yield. “We had a cold, wet spring and hot, dry weather through the summer so there has been a low-level of parasitic challenge to date. Parasites have only been there at low levels and haven’t been able to spread very much,” he said. Mr McElroy said as soon as farmers hear increased coughing or notice a strong dip in milk yield in their herd it is important they treat for lungworm. “Increased coughing is a big sign of lungworm. Also watch for a big drop in milk yield. You’ll get coughing two to five days later. Lungworm or hoose is caused by a parasitic worm and although normally associated with being a problem in calves in their first grazing season it can, under certain circumstances, be a problem in subsequent grazing seasons. 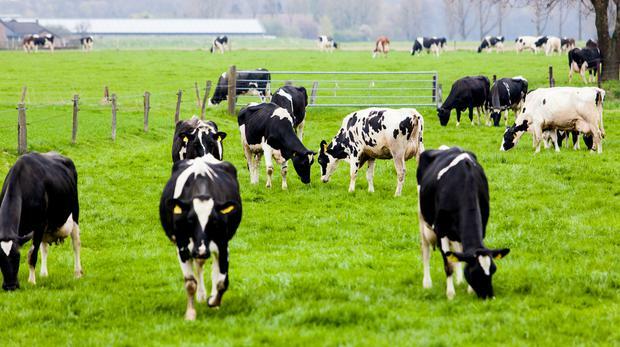 Outbreaks can be widespread, unpredictable and of economic significance resulting in reduced animal performance, milk yield and in severe cases animal losses. Symptoms are usually seen in young cattle in their first grazing season in the later part of the summer. The nature and severity of lungworm infection depends on the number of larvae that are ingested and on the response of the animal. Lungworm can have both direct and indirect effects. The indirect effects are mainly a result of inflammatory responses where the lungworm reproduces and begins egg production. Individual animals will differ with regard to the severity of the symptoms. If left untreated parasitic bronchitis is the main issue in previously naïve cattle which is usually (but not always) animals in their first grazing season. In Irish conditions we normally see outbreaks in the period from August to October but this can vary year on year depending on grazing conditions, weather etc. Clinical signs of disease include Intermittent coughing particularly after moving stock. Moderately affected animals will have coughing bouts even when they are resting and may show signs of increased difficulty in breathing. Heavily affected animals suffering from respiratory disease have an increased breathing rate accompanied with opened mouth breathing with head and neck outstretched. The tongue will also appear as they try to cough. The cough will be the harsh deep ‘husk’ cough. Cattle can lose condition rapidly.